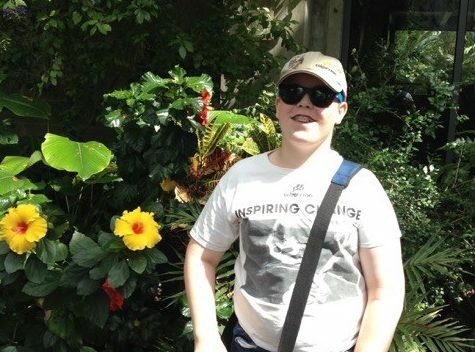 Ask Adam what a great weekend looks like and it, unquestionably, involves one or two days at the Calgary Zoo. Birthday parties — at the zoo. Of course. Other holidays? Well, what do San Diego, Florida, Santa Barbara, Santa Anna and Orange County have in common — yep, you got it. The all have zoos. And Adam has seen them all. 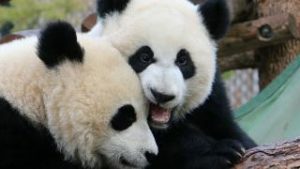 His dad, Scott Fisher, takes responsibility for this adoration, quipping that it may have happened in utero, which is when he and his wife started visiting the zoo . . . and it’s never ended. Genetic influences aside, here’s why Adam is taking two sessions of the Zookeeper Camp this summer and then another two of Zoo Academy Camp. As for the Zoo Academy Camp, Fisher (who also has three dogs, a cat, and eight pancake tortoises at home) is fascinated with the biodiversity of our planet and lights up when he can share those eco-findings and biofacts by working at one of the touch tables. 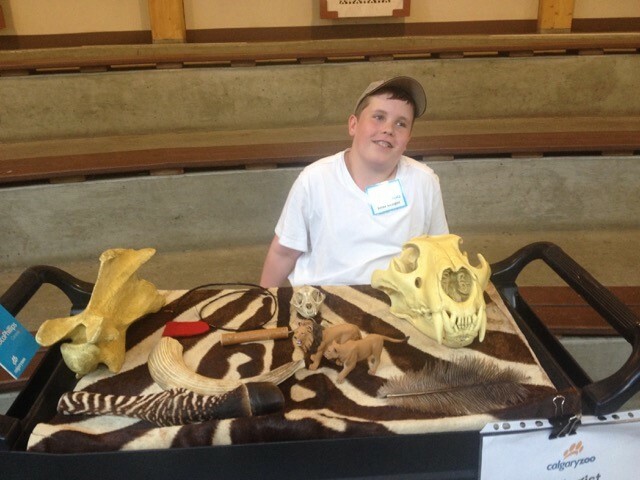 Adam Fisher, 13, working at one of the Calgary Zoo touch tables during Zoo Academy Camp. “Last summer there was a little girl who came up to one of my tables with so many questions,” he explains. “I talked to her about ostriches, lions, giraffes and how they all can co-exist in the wild by adapting to their environments. When adults set out to find ambassadors, rare is the one that requires no script. That “ambassador,” although no title has been bestowed upon him, is Adam Fisher. Combine his singular focus with his breadth of biofacts, that span Antarctica to Africa’s savannah, and add a sparkling, genuine love of animals to the mix and you’ve got an extraordinary young champion. Okay, okay — we had to ask —when Adam gets home, after school, what does he do for fun? You may be relieved to know he sometimes plays video games. Which ones? Zoo Tycoon. Or, he’ll watch some TV — Africa by Sir David Attenborough is his latest favourite. Or he’ll flip through his animal encyclopedias. As for his favourite animal — it’s a zebra. “It’s so cool that each one has its own unique striped pattern. Did you know there are three species — the plains, the mountain and the Grevy — and six subspecies of zebras. And zebras are not actually black and white, they’re brown and white. His least favourite? “Well, that’s hard. I like them all . . . but I guess what I don’t really get are butterflies. I know a lot of people love them, but I don’t really get it. How many 13-year-olds know anything about any master plan? All child members receive 10% off of all summer camps. Come join us for a week or three of zoo summer fun!